Even though we're still months away from the release of Star Wars: Episode VIII The Last Jedi, work has been underway on its sequel, Star Wars Episode IX, for some time now. Director Colin Trevorrow was announced back in August 2015 and now a new writer has been brought in to help polish the script he's been working with. The Hollywood Reporter is reporting that Jack Thorne has been brought in to re-write the script Trevorrow had been working on with his Derek Connolly (with whom he co-wrote Jurassic World). This sort of change is nothing out of the ordinary for major blockbusters. Michael Arndt was hired to write the first drafts of The Force Awakens, before JJ Abrams and Lawrence Kasdan took over the writing duties. Rogue One saw even more change over, with Gary Whitta writing the first draft, with Chris Weitz taking over after that and then Tony Gilroy coming in to finish it off (there may have been even more writers brought in that we don't know about). Both of those films turned out fine, both scoring over 85% on Rotten Tomatoes. Thorne is best known for his in the theater, co-writing Harry Potter and the Cursed Child with JK Rowling and John Tiffany. He also recently wrote a new adaptation of Woyzek, which starred John Boyega (who, presumably, will be reprising his role as a Finn in Episode IX--assuming he survives The Last Jedi). When it comes to film, Thorne wrote the 2014 film War Book and the upcoming film Wonder, starring Julia Roberts and Jacob Tremblay. In television, he has written the miniseries' This is England '90, The Last Panthers, and National Treasure. 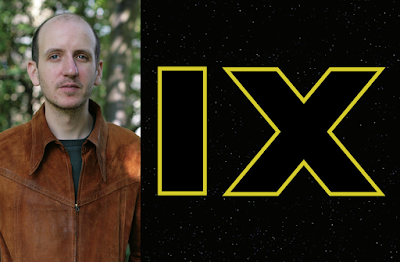 Much of the original plan for Episode IX had to be reworked early this year following the tragic death of Carrie Fisher (Princess Leia) in December 2016. Lucasfilm Kathleen Kennedy revealed to Vanity Fair several months ago that Leia was expected to play a major role in Episode IX. However, this has since been changed as Lucasfilm released a statement saying they would not use CGI to recreate Fisher's likeness for Episode IX (like they had done with Peter Cushing as Grand Moff Tarkin in Rogue One). Trevorrow, for his part, won't say much about the film, but did promise fans back in June that, "I can guarantee it will be handled with love and respect, and all of the soul that Carrie Fisher deserves." Star Wars Episode IX is slated for a May 24th, 2019 release date.